I favor the hydraulic lifts at bottom of page-I believe they are more reliable and will cost less in the long run even though initial expense may be a little higher than electric chair. 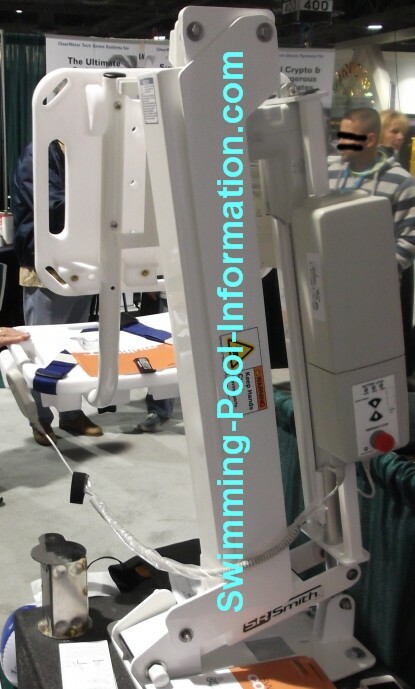 Which Pools Must Have a Lift to Comply? 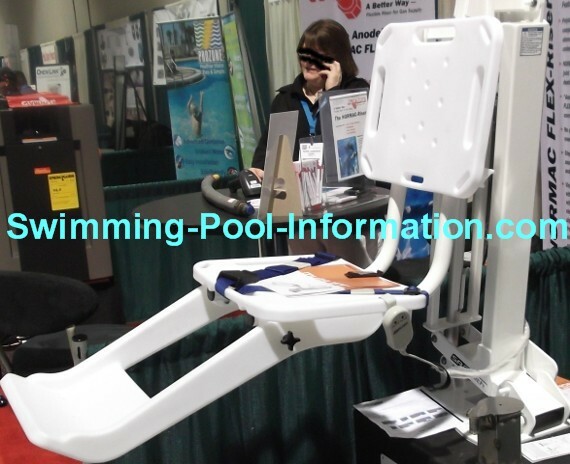 So which pools must comply with ADA and have A pool lift and/or a ramp? When I first heard about these new codes I thought it was another way for manufacturers to lobby Washington to pass unnecessary laws to so they could sell products. But I have come to realize these lifts are not just for people permanently disabled, but also people going through some sort of therapy (such a a disabled veteran)or simply of old age. In any case,this may one of the few ways these people can get exercise and prevent muscle atrophy. 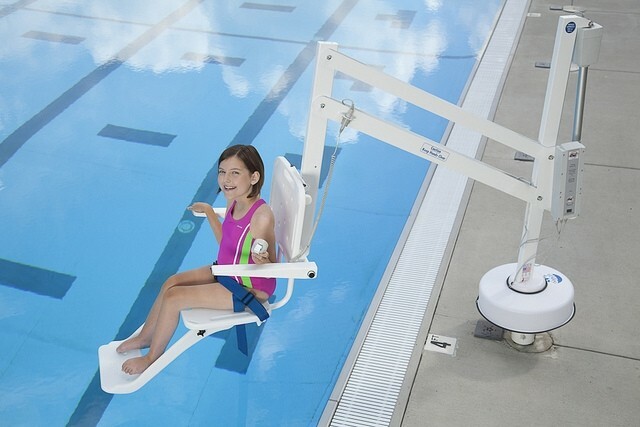 Also the having the chair automated gives the disabled person independant pool access without having to feel they are being bothersome to the staff of the facility,which hopefully will lead to exercise being a more enjoyable activity they are inclined to continue. 1)A plaintiff can sue...usually there is no monetary award given on these cases from what I have read but the defendant may be required to pay plaintiff's attorney's fees in ADDITION to having to remedy the violation. 2)The ADA is also enforced indirectly by requiring compliance prior to receiving licensees, certifications, or grants from prevailing authorities - for example building permits and/or certificates of completion on some construction until violation is remedied. There are also exceptions such as in a tight area that may not provide enough room between the chair and,for example a wall or door. The S R Smith Multilift shown above is one of four models of electric battery operated chair lifts by the S R Smith company. This is the best of the battery powered models I have seen so far. Battery operated chair lifts offer easy installation and easy operation. Warranty is 3 year on frame,2 year on electronics,1 year on battery. 350 pound capacity. Below is the controller and power pack including battery. The S R Smith website link is below the photo. Shown above is the Aqua Creek Ranger also branded as the Pentair Aqua Tram below. Aqua Creek makes several models this being their low cost option with 300 pound capacity. 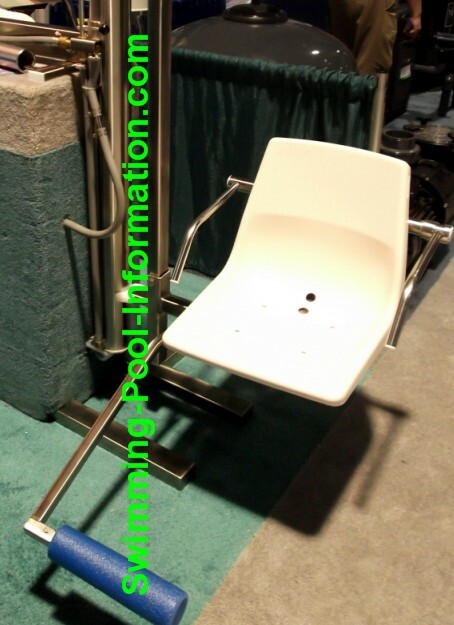 This chair is good for facilities on a budget or in a case where the chair may rarely be used and the facility needs to comply with the minimum legal standard. Its not a bad chair but the footrest is a little flimsy - to be fair its not intended to support weight. 2 year warranty. Link under bottom photo. 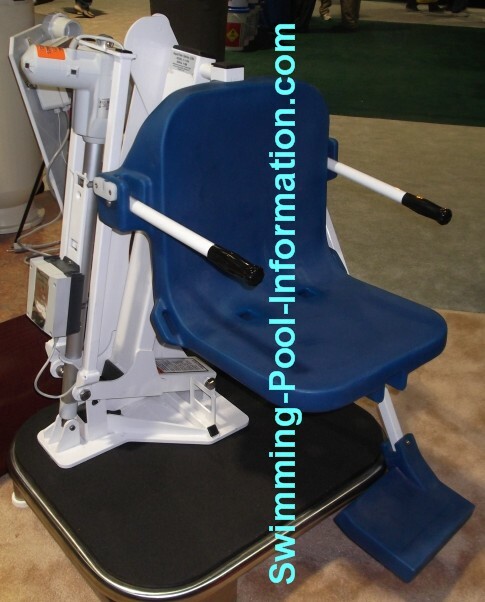 The Aqua Access Hydaulic chair lift shown in the starting position above and after swinging 180 degree into the pool below. 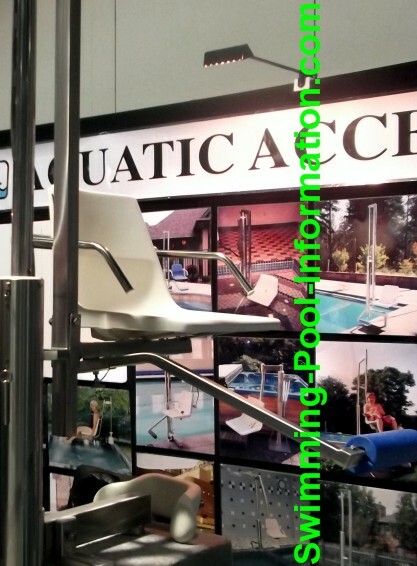 They make several models for different type of pool configurations. These chairs are unique because they use water pressure from a hose or pipe to operate,no batteries are needed,which can get quite expensive,especially if the chair is used frequently. These chairs are made from high quality stainless steel and probably the least expensive in the long run but are more expensive and require more labor to install due to water connection. 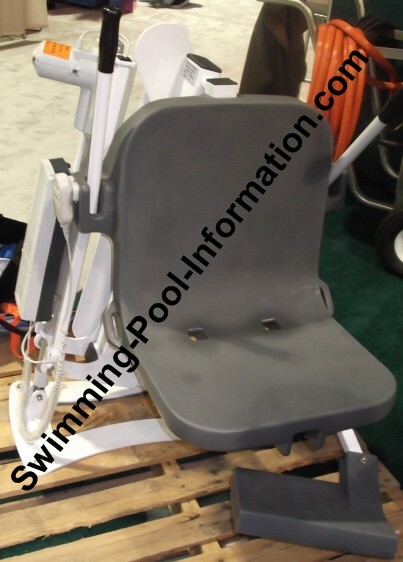 This particular chair has 400 pound capacity and 1 year warranty on valves,seals,and footrests and 5 year warranty on the rest of structural components. Company link below bottom photo. I have heard of issues regarding having to change the water hoses annually but this may be due to using improper hoses that are not designed to withstand chlorine.